Here’s a little info of things that will make other people doing a trip up here enjoy themselves alot more. 1. BUGS: There’s tonnes of blackflies so going later in the season (late Aug early Sep) really helps. Also bring a bug hat at a minimum. If the temps get much above 5C they are out. 2. Its COLD! : Three of us bought second sleeping bags on this trip. Even though its nice and toasty durring the day it’s cold at night. We had frost on our tents every night. I also had the liner in my jacket 90% of the time. Warm gloves and heated grips are nice too. 3. 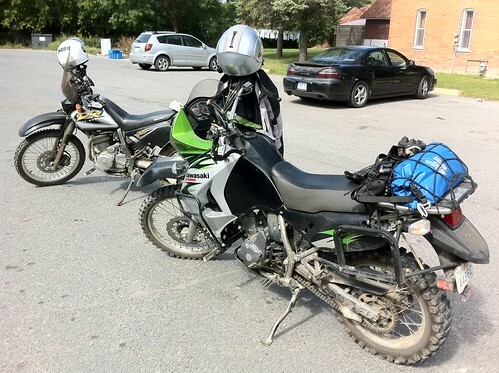 Gas: My KLR gets ~300 KM before hitting reserve when fully loaded. My tank holds around 23 L (6 Gal) so I carried another 20L to be able to do the trip. There are a bunch of gas stations but some have short hours. We lucked out in the fact that it was almost Caribou season and everything was open. Including buying gas at the end of the TT. 4. Speed: Despite the fresh graded sections we were able to maintain some wickid speeds. Offroad I was averaging somewhere around 95Km/h with the straight sections being over 120Km/h. On the JBR was another story, the speed limit is 100Km/h and you have 600Km of road with no cops. This means BAD gas Mileage!!! So bring a bit extra gas even if you think you’ll make it. 5. James Bay: When going to James Bay don’t go to Chisasibi. Instad half way there you will see a turn off heading north across a dam. That is the way we went and it’s much more beautiful. You also get a less obstructed view of the water. 6. Water: Always cary at least a liter of water with you. When we headed to James bay most people didn’t realize that it’s SALT Water! Whoops! Also we didn’t always end up camping near water and when we were in the gravel pit we ended up pumping water from a large puddel with my water filter. 7. Cell Phones: Supprisingly Bell/Telus (CDMA Phones) worked in alot of places including Radisson. GSM phones (Rogers, AT&T, etc.) did not. 8. Wifi: There is wifi at the Auberge Radisson (Name: Zone_1 WEP Key: Radisson_1 , Zone_2/Radisson_2, etc.) You need to be in the lobby for it to work. Also throttlemeister found free wifi at a resturant in Radisson. Finally there is free wifi at Mirage Outfitters but it’s VERY SLOW. If you have a phone (iPhone) that can do VOIP calls set it up before hand just in case. That’s about it for now. If there’s more I’ll make another post.